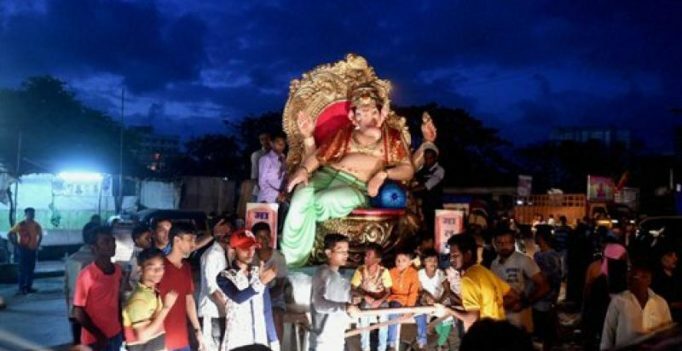 Mumbai: Mumbaikars on Monday welcomed the God of good luck and prosperity–Lord Ganesha into their homes and community pandals, kick-starting 10-day-long Ganesh Chaturthi celebrations with zeal and fervour. The festival commenced with devotees installing colourfully-crafted idols of their most beloved and venerated deity, Ganesha, in their homes and beautifully decorated pandals across the city. The mood was full of gaiety and devotion, with chants of ‘Ganpati Bappa Morya’ reverberating across- as devotees took part in ‘aarti’ at several temples, including the famous Siddhivinayak Temple at Prabhadevi in South Mumbai. This year, even megastar Amitabh Bachchan has lent his voice for an ‘aarti’ at Siddhivinayak Temple. The 73-year-old actor has recorded the aarti in his voice and tweeted that it is a “blessing” for him to be given this “divine honour”. Several popular Ganesh Mandals were thronged by devotees since early morning, with the popular Lalbaugcha Raja kick-starting the prayers at 4 am, followed by darshan for devotees at 6 am. The Ganesh idol here resides on a throne shaped like an Owl. Other prominent Ganesh mandals like GSB Seva Mandal in Kings circle, has a 14-feet long idol made of clay while Wadala GSB Mandal has designed its pandal like the famous Tirupati Balaji Temple. These pandals witnessed a sea of people waiting to get darshan of the elephant-headed God. Bollywood personalities like Salman Khan, Jeetendra, Nana Patekar, Akshay Kumar, Hritik Roshan, Shilpa Shetty, Suresh Wadekar, Govinda and a host of Marathi film and theatre actors are prominent among the celebrities who celebrate Ganesh Chaturthi at their homes. Chief Minister Devendra Fadnavis also installed a Ganesh idol at his residence and took to Twitter to share the same.